Last week’s Photo Challenge was to take pictures, throughout a day, with your phone. Easier said than done. I kept forgetting. Made split pea soup with peas that had soaked overnight. Hung towels outside to dry. (The dryer failed to function today.) As soon as I headed out the back door with the laundry basket, it started to snow. Really? In April? You can see the snowflakes. Right after I snapped this picture, I clothespinned my mitten to the towel I was pinning up. It was freezing! I checked the rhubarb. It’s coming up! Can’t wait to make Strawberry Rhubarb sorbet or soup, or pie. Returned Les Mis to the library. I am sad to report that I did not finish reading the book. The librarian called and they wanted their book back. There were other people waiting to read it. I hope they are able to finish it. I will try again in the future. I did, however, watch the 25th Anniversary broadcast of Les Mis on PBS last week. Incredible! Incroyable! MacGyver called and needed me to bring a saw to his job site. It was in the truck that was at home, not the truck that he had with him. It’s a hack saw or a coping saw or some such saw. But before I drove to where he was working with the saw, I took a picture and texted it to him, to make sure I had the right one. And that’s the only reason that I have a picture of that part of my day. Before bed, my son was reading. I went in to tell him it was time to turn out the lights, when I noticed his silhouette (silhouette* – a good French word, un bon mot) on the wall. You can even see his eyelashes. When I showed him the picture, he said that somebody used a silhouette like this to come up with the idea that witches should have long noses. 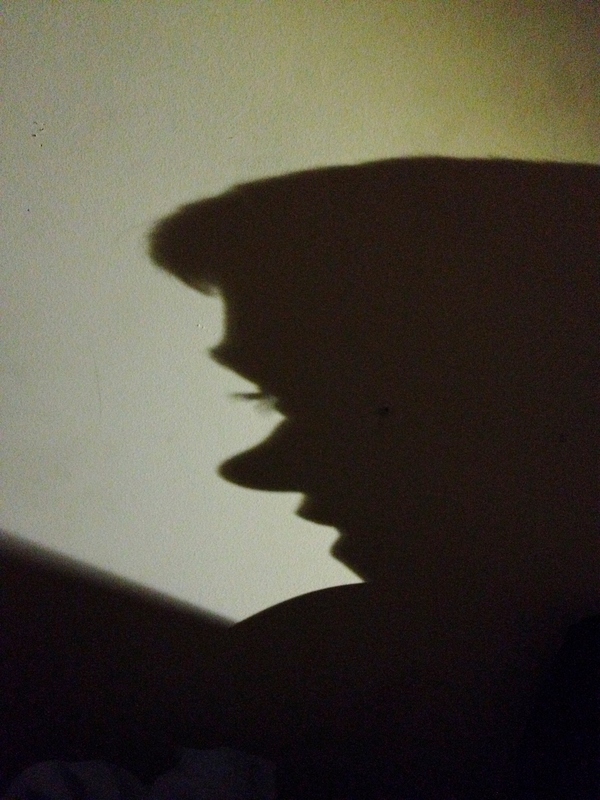 His nose is small, but looks rather Pinocchio-like in the silhouette. I love the way he thinks about things. 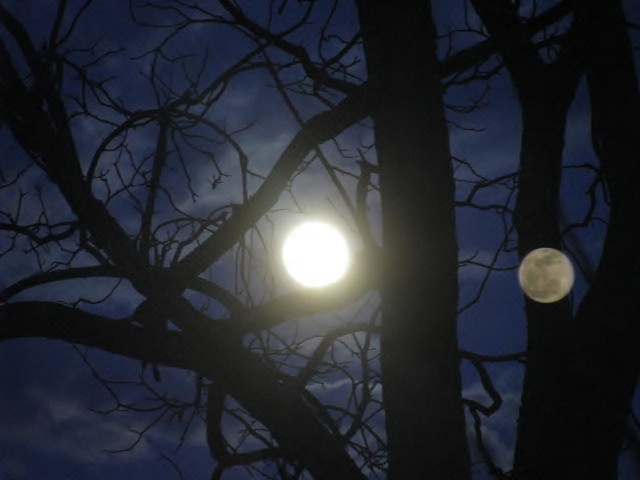 After the kids were in bed and I had finished cleaning up in the kitchen, (and having a brownie snack), I saw the full moon out the kitchen window. I snapped this picture, not realizing until I added it here, that because of the double pane glass, I also got a clear reflection of the moon off to the right. Wow! Even ordinary photos can be extraordinary. And ordinary days can be extraordinary, too! Enjoy every day – ordinary and extraordinary! Super pictures, especially the moon shot! Gotta love those little surprises. My rhubarb is up too — in fact, one is in full bloom. I recently posted a photo of it. Great way to present the passed week … I suppose the spring is a bit behind with where your too … an ordinary week is always extraordinary … in the end.